It seems today, we live in a “culture of offenses.” Media outlets absolutely make a living on sharing (or creating) the offenses made by others. I didn’t realize I was supposed to be offended until I they told me! People love to build their camps of folks sharing offenses. It’s as if somehow we feel vindicated or justified in our offense and bitterness if we have a team around us. Companies offend, leaders offend, Christians offend, Pastors offend, Dads offend, Cops offend, Patrons offend, I guess we all offend and all GET offended! We’ve all been there: offended or hurt by the actions of others, wounded by the words others have made, angered by the selfish or inappropriate behaviors of people. I’m even convinced that some people are (hopefully unknowingly) looking for the next offense from someone, almost like a chip on the shoulder! Matthew 18.15-17 says: “If your brother sins against you (that is, someone offends you), (YOU) go and tell him his fault, between you and him alone (In private, not telling all your friends and building your camps, etc). If he refuses to listen to them, tell it to the church. And if he refuses to listen even to the church, let him be to you as a Gentile and a tax collector (Have nothing else to do with him). So, what if WE start to take responsibility for our own heart and offenses? That means that we go to that person in humility and share your offense, and let this process play out. Notice, NOWHERE did Jesus say to get even, or punish, or try to damage reputation. Ultimately, if the offender won’t acknowledge, let him go. What if we choose not to take up offense? What if we choose to see offenders as broken people in need of God’s grace, and not as people who are out to get us? What if we stop relationships with people who constantly offend us? What if we follow the example of JESUS, and extend grace and compassion towards those who hurt us? What if WE who are offended take the responsibility to let go of an offense? What if we just get over being offended? 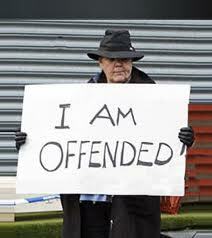 Being offended all the time, it’s just not a good way to live this life. Hey, if I’ve ever offended you, my bad. If you’ve ever offended me, I don’t remember.